The MBW Review offers our take on some of the music biz’s biggest recent goings-on. This time, we think over the possibilities for Spotify outside of its core territories of Latin America, Europe and North America. The MBW Review is supported by Instrumental. Share price-watching Spotify investors have been starved of good news of late, but this week has brought them a welcome boost. The market cap of SPOT grew nearly 7% at the bell on the New York Stock Exchange yesterday (November 26) – largely, it appears, thanks to reports suggesting that the loss-making company’s expansion into India may be back on. The major labels have played hardball with licensing Spotify in India this year: Daniel Ek (pictured) is believed to have originally been plotting a soft launch in the market over the summer, which never arrived. This is an understandably exciting prospect for Spotify’s Wall Street supporters. 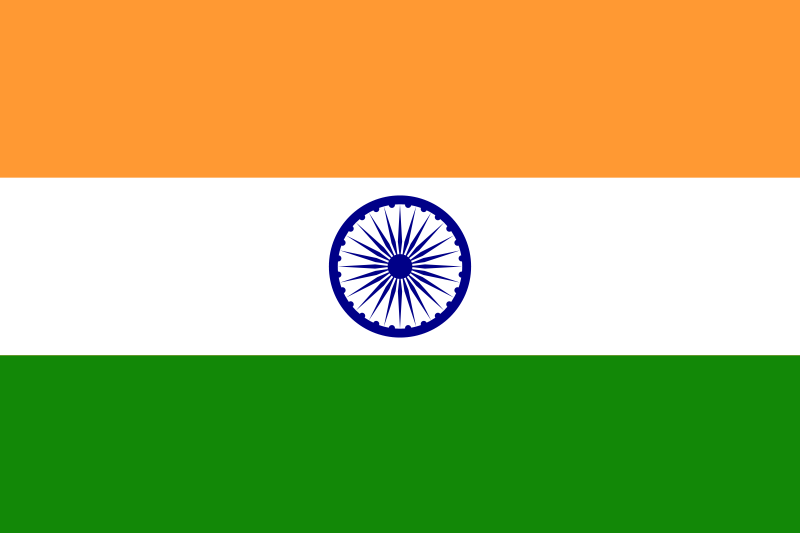 India’s 1.3bn population is approximately seven times bigger than the 191m monthly active users SPOT counted around the world at the close of September. And, according to an IFPI/IMI Digital Music Study of India published earlier this year, the average internet user in India spends 21.5 hours per week listening to music – significantly higher than the global average of 17.8 hours per week. These are positive signs for Spotify, whose global subscriber growth is beginning to sag – which may or may not be an early sign of paid-user saturation in its biggest markets. Spotify recently signalled its hunger for further international growth by expanding into the Middle East and North Africa, which took the firm’s global footprint to 78 countries. Spotify faces tough competition in MENA, including current music streaming market leader Anghami (with its estimated 50m users) as well as Deezer – which, thanks to a recent investment deal, has acquired exclusive distribution rights to the powerful local repertoire of Rotana Group in the region. If Spotify does eventually launch in India, it will find the competitive landscape no less forgiving, largely thanks to recent large-scale consolidation. 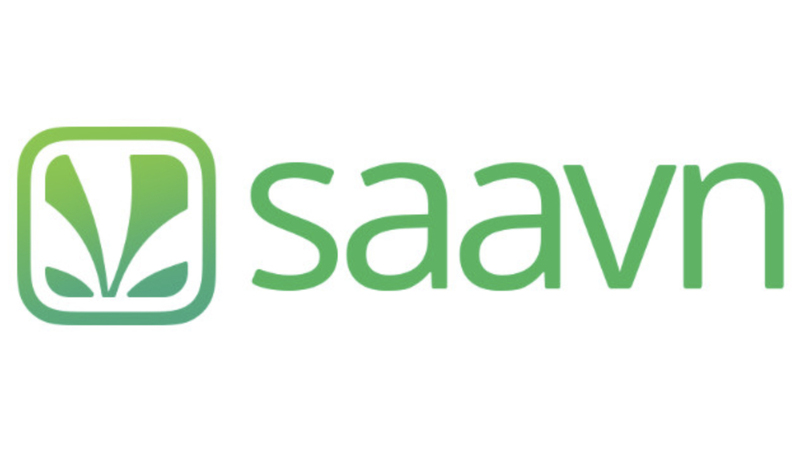 Saavn, which has pioneered a streaming-service-as-label approach with its direct artist deals, recently came together in a $1bn-valued merger with local rival JioMusic – no doubt in anticipation of Spotify’s arrival in the territory. Elsewhere, China’s dominant streaming player, Tencent Music Entertainment, recently invested $115m in another leading Indian service, Gaana. However unwelcoming these competitors may be to Spotify’s arrival in India, the company knows it has to accelerate its worldwide growth. 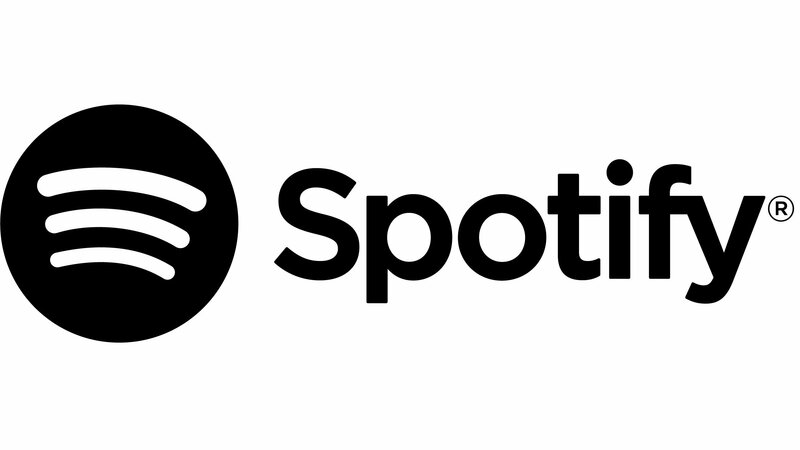 Earlier this month, Spotify CFO Barry McCarthy reiterated to investors that the firm was “aggressively pursuing” a strategy of global expansion. As we’ve previously covered, Spotify reveals the geographic percentage breakdown of its active users and its paying subscribers each financial quarter. 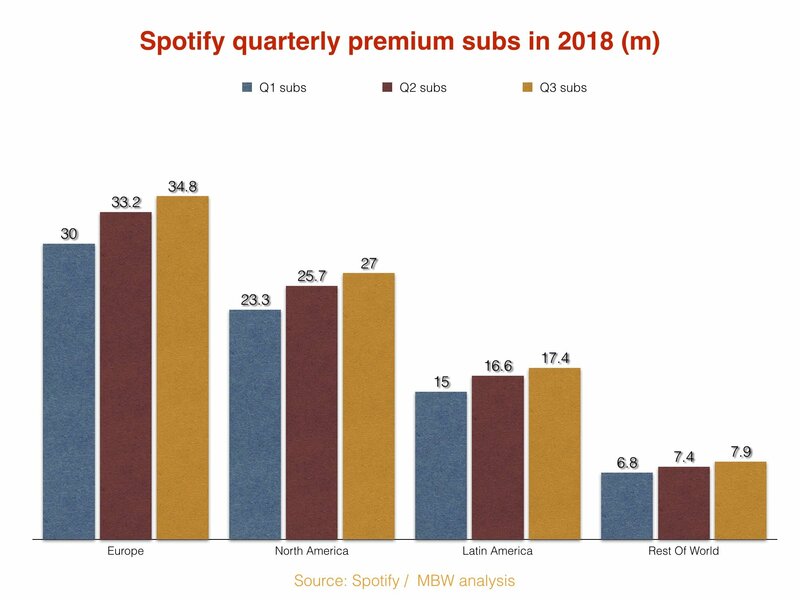 MBW has now analysed these numbers to get a clear picture of Spotify’s performance in Europe, North America and Latin America in the first nine months of this year – and, more pertinently, its performance outside of these markets. As of the end of September, Spotify had 79.2m subscribers across Europe, North America and Latin America – ten times the amount it had in the whole of the rest of the world. The company also counted 170m monthly active users across these three territories – eight times the amount it had in the rest of the world. So far, so expected: these numbers were confirmed before Spotify’s expansion into the Middle East and North Africa, and obviously before its expansion into India (which is yet to happen). What’s more, Barry McCarthy is on-record as saying the firm has no plans to expand into China. Between these three regions (China, India and MENA) alone, that’s around 3bn people – or approximately 43% of everyone on this planet – that Spotify wasn’t reaching at the end of Q3 2018. That said, Spotify has made major efforts to expand into new regions outside of Europe, North America and Latin America in recent years, including Japan, Thailand, Malaysia, South Africa, Israel, Vietnam and Romania. It’s also already active in Hong Kong, Indonesia, Australia, the Philippines, Singapore, Taiwan and New Zealand. Monitoring Spotify’s performance in these territories gives us a useful impression of how it’s faring outside of its most popular (and lucrative) markets. To put that further into context, that 845m is over 200m more than the size of the population of Latin America. Where things get extra interesting on these Spotify geographic numbers is when we look at the firm’s growth rates in specific territories from the end of Q1 this year (March 31) to the end of Q3 (September 30). 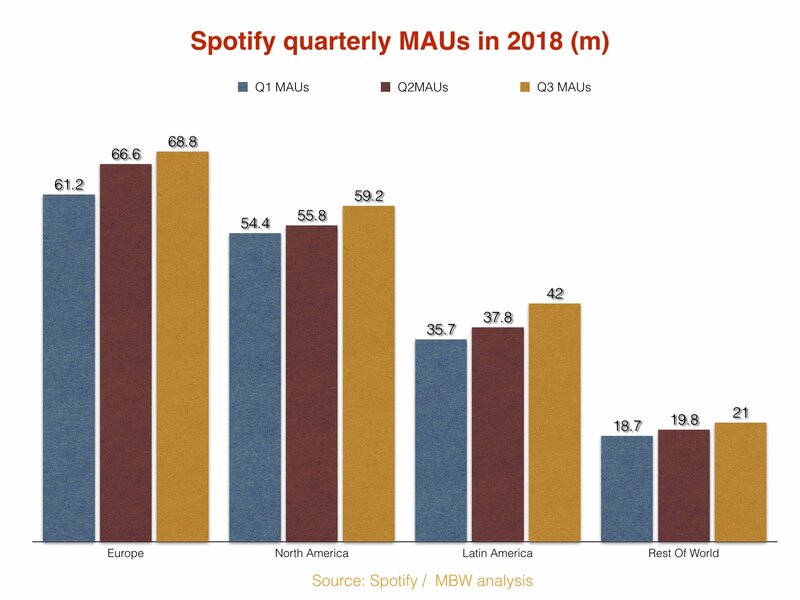 As you can see below, Spotify grew its user base significantly more in each of Europe, North America and Latin America than it did in the ‘Rest Of The World’ during this period. There was nearly three times the growth in Latin America than Spotify saw in the collection of countries named above – despite the latter group having the bigger population of the two. 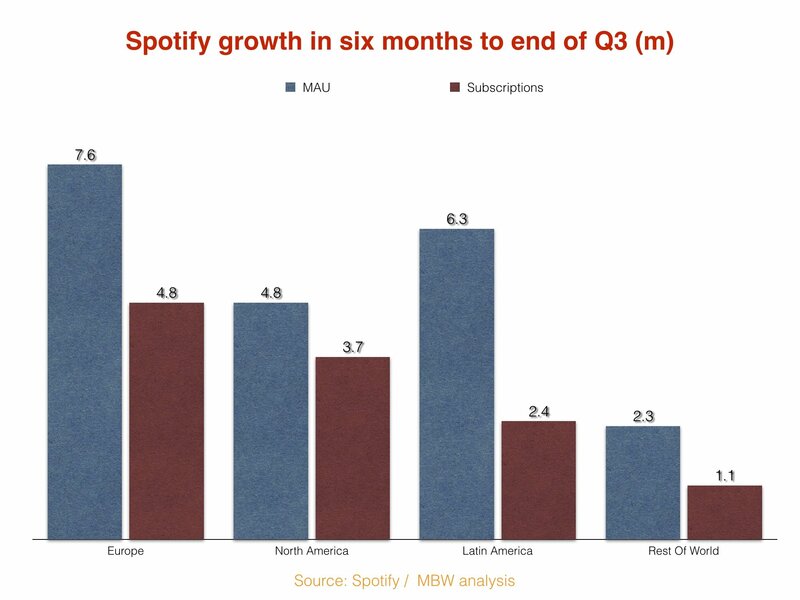 Europe, by far, remains Spotify’s strongest territory, with 7.6m more MAUs and 4.8m more paying subscribers joining the service in this six month period. In fact, according to these numbers, just 11% of Spotify’s total active user additions in March through September this year came from outside North America, Latin America and Europe. Obviously, in the patchwork of countries which make up ‘Rest of the World’ above (not including MENA, China or India, remember), there are vast swathes of people with lower access to mobile technology and coverage – not to mention lower disposable income – than in Europe and North America. The same could be said, however, for Latin America, which in this case encompasses Mexico, Brazil, Argentina, Chile and many more. One obvious takeaway: just because Spotify launches in a territory – even a territory as densely populated as Indonesia, for example – doesn’t mean that market is necessarily going to take to the service en masse. Spotify’s management are smart to adopt an ambitious approach to MENA and, if those label licenses come good in 2019, to India. In Daniel Ek’s quest to banish his company’s losses via worldwide market dominance, standing still is not an option. Yet Spotify’s investors would do well to remember that such expansion means facing tricky and unique challenges – including aggressive local players, not to mention the likes of Apple, Amazon and Google. Speaking of which: according to IFPI/IMI’s 2018 report, more than half of music streamers in India (52%) who don’t currently pay to subscribe to a service cite the free availability of music on YouTube as a reason why. Sometimes, no matter where you travel in the world, you find the same old obstacles standing in your way.